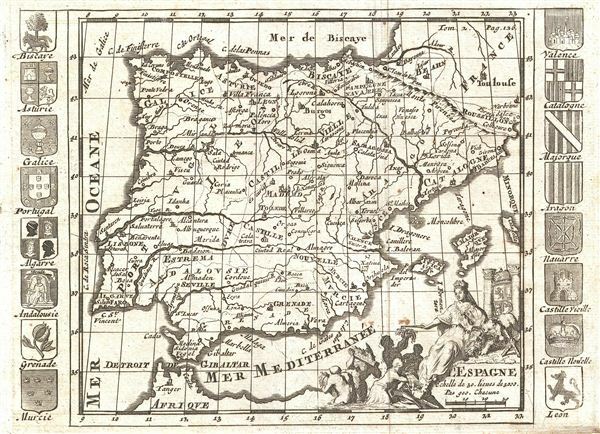 An uncommon c. 1700 map of Spain and Portugal. The map covers the entirety of Iberia as well as adjacent portions of Frances and Africa, and the disproportionally outsized Balearic Islands of Ibiza, Majorca, and Minorca. An elaborate allegorical title cartouche appears in the lower right quadrant representing a queen accepting offerings from various subjects who themselves seem to be emerging from the sea. This is possibly suggestive of the wealth generated from Spain's vast New World empire. The map is surrounded by sixteen armorial crests representing Portugal and the various regions of Spain. This map is ascribed to one ‘Chacune' of whom we have been able to identify no specific references. It was prepared for Martineau du Plessis' Nouvelle Geographie, published in 1700.